Standing on the site of what was once the official residence of the 16th century Consul of Navarra (a Spanish province), the hotel as we know it today has, perhaps, had an even more eventful history than its structural predecessor. Present day guests at this listed monument enjoy all the comforts one would expect from a four-star establishment. 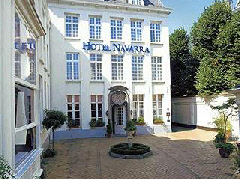 Poet Henry Wadsworth Longfellow is known to have stayed at The Hotel Navarra, during which time he penned his famous verse The Belfry of Bruges. The building was also the home of the Belgian government between October 31 till November 21, 1918 having returned from exile after World War I.